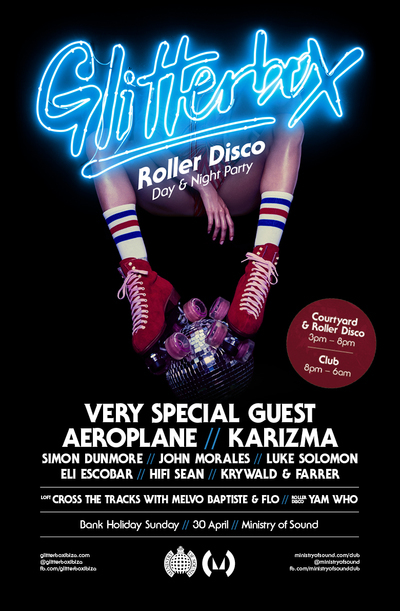 After the apparent success of last August’s day and night party, Glitterbox is back with the full roller disco experience, with headliners in the shape of Roger Sanchez, Aeroplane and Karizma. Taking full advantage of the May Bank Holiday with an all-day, all-night extravaganza, Ministry will open an outside stage during the day for the likes of Simon Dunmore, Luke Solomon, Eli Escobar and John Morales. Percolate residents Krywald & Farrer and London’s Savage resident Hifi Sean are also set to play, while Yam Who will soundtrack the roller disco in Ministry’s Box room. Later, rare grooves, soul funk and disco will be playing all night in the Loft courtesy of Baptiste and Flo, while the headliners head to the main room to take the night away. The Glitterbox dancers will be performing and joining the crowd to dance throughout the party, while the street food trucks and photo booth that were apparently popular at last year’s event will make their return. Summer 2016 saw Glitterbox come of age in Ibiza and the UK. The parties at Space, Ibiza drew thousands of clubbers across 17 weeks, encapsulating the hedonistic spirit of the legendary venue during its final season. In addition to Glitterbox’s two events at Ministry of Sound, Glitterbox also presented stages at We Are FSTVL and Defected Croatia.